Magnolia Verandah: Love that pinny! 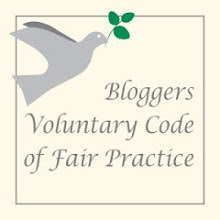 We spent some time in my sister's kitchen late last year when we dashed over to the UK. As when in Rome you do as the Roman's do. 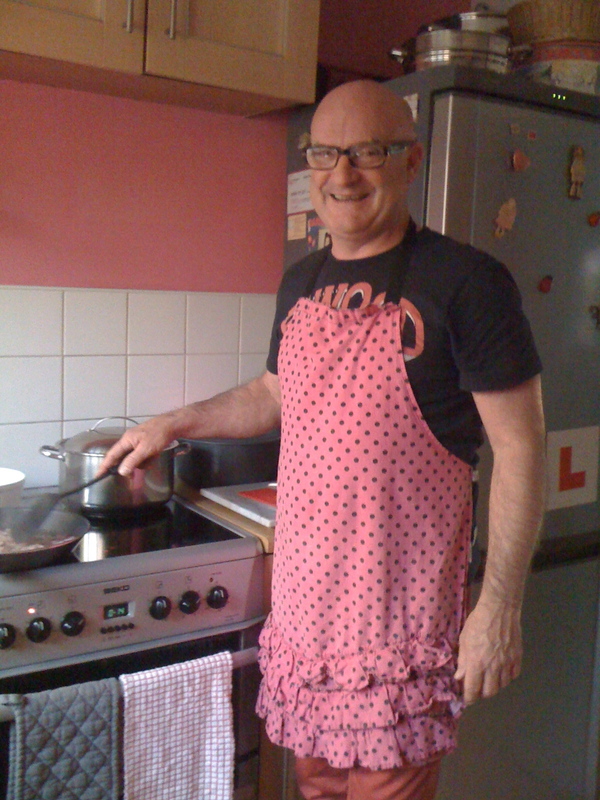 So as we were cooking pasta (a lot) and to protect the new clothing from getting splashed my sister produced this lovely pinny to protect the cook! It was her favourite! 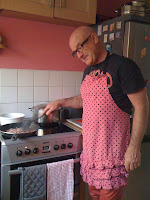 We laughed and laughed - I can't resist a man in a pinny. Anyway as a little gift we bought her a book by those two greedy Italians called Two Greedy Italians eat ITALY by Antonio Carluccio and Gennaro Contaldo and we really love their show too. My sister's girls were very impressed with the gift and decided what the man would cook which gave us girls lots of time to chat. As the girls do not have particularly adventurous palates Pappardelle con Spech e Porcini seemed perfect. Instead of spech we used bacon which worked just as well and button mushrooms. Add the chopped bacon and sliced mushrooms and cook until the mushrooms are collapsed into the pan. Add salt, pepper and thyme leaves to taste. Prepare the pasta in a large pot of salted boiling water to al dente. Add the drained pasta to the pan of sauce, reserving a little of the water to add to the pasta and sauce if necessary. Mix so the pasta is well coated by the sauce. Serve sprinkled with remaining cheese and thyme leaves. I hope my sister and her girls make this again we all loved it. In fact we were so intent on eating we forgot the camera and all I have to remember the dish is the man in the pinny. 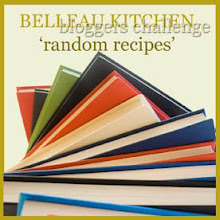 I am linking this with Random Recipes No.24 for January over at Belleau Kitchen - another country -another kitchen. I am familiar with Gennaro through Jamie Oliver...how I wish we had his show on our Food Network. Yes, and the apron is pretty spectacular. The combination of these two italians - the humour, the food and the travel makes it one of our preferred cooking shows. Thanks for your comments - the apron was a hit! Love the cookbook, love the guys, love the pasta and love that apron! I remember the evening well - can't imagine what my neighbours must have thought with the music blaring and all the laughing. Nevertheless I'm glad you were here - a little laughter keeps us all jogging along, even when we don't want to jog! I still have a little giggle at the pinny photo, and it was a lovely evening under the circumstances. And the pasta was lovely. 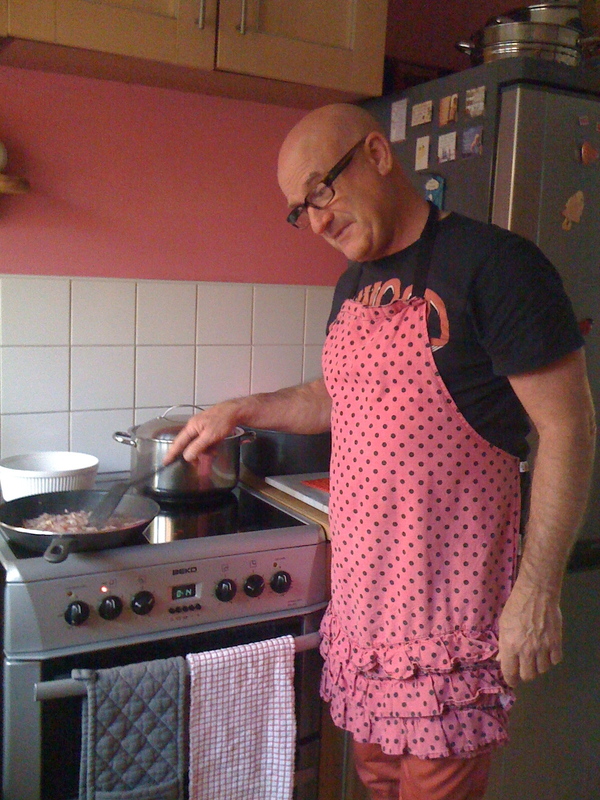 This was the number one google image search for 'pinny.' I love this photo whoever the chef is he looks like a very happy man.